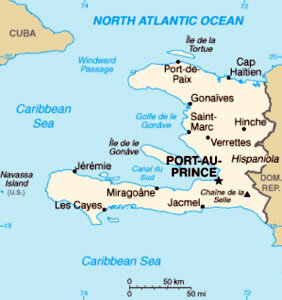 The Republic of Haiti occupies the western third of the island of Hispaniola, in the northern Caribbean. It is bordered on one side by the Dominican Republic. It is less than 750 miles from Florida and sits in the middle of the hurricane belt and the climate is often hot and humid. The capital is Port-au-Prince. Languages are Haitian Creole and French. Haiti achieved independence from France in 1804 and is the poorest country in the Americas and one of the most disadvantaged in the world. Over 40% of the population is unemployed and 65% of its population lives under the poverty line; only 52.9% of the population is literate. It has the highest incidence of HIV/AIDS outside of Sub-Saharan Africa. A cholera epidemic in 2013 caused a lot of deaths and has escalated due to the lack of sanitation. We know how to stop cholera with the most basic medical resources, but Haiti doesn’t even have that and the cycle of disease and poverty continues. In Haiti there are 25 doctors per 100,000 people, compared to 230 per 100,000 in the United States. Private and parochial schools provide approximately 75% of educational programs in Haiti. More than half of the children aged 5 – 17 do not attend school. Only 63% of those enrolled in primary school will actually complete this schooling and of those, only 55% will enroll in secondary school. In the capital city of Port-au-Prince, only 23% of adults have completed secondary school and of those, only 16% passed the state graduation exam. The country faces shortages in educational supplies and qualified teachers. Most private primary schools cost around $10 per student for attendance and three times this amount for secondary school. Secondary education is a critical component to alleviating the widespread suffering poverty causes in Haitian society. Poverty prevents students from receiving the education needed to earn higher wages, which leads to lower GDP and further poverty across the nation.